Keep your stitches from slipping off of your needles when you put your project down. 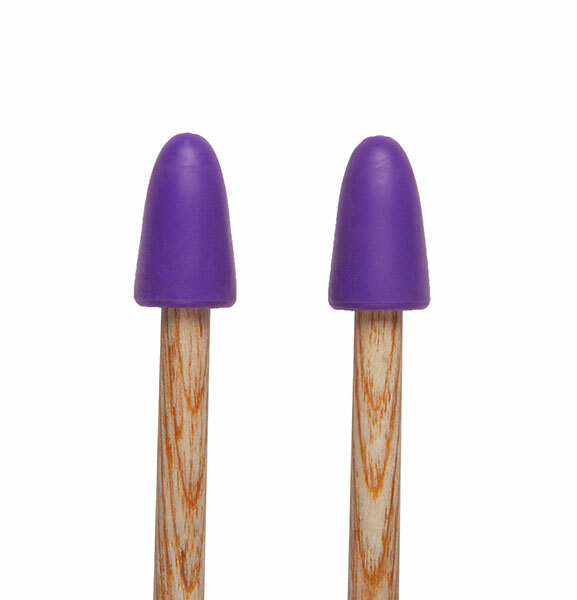 Put these point protectors on the ends of your knitting needles, and your project will be secure. Very useful if you knit on the go! Choose from small or large sizes. Size small fits US needles sizes 0-5. Size large fits US needle sizes 6-13. 2 sets per package. These are by far the best point protectors I have been able to find. Absolutely great for use on DPNs when there yarnovers at either end. I've used them for several weeks and have not had a single one come off accidentally. I love these, and are the best I have used! Best I've ever had; used for years. I also use them with double point needles when knitting narrow lace or mitered squares or other modular pieces. They stay put and just plain do the job.